Practicing Western astrologer Agneta Borstein uses an East-West astrological approach to the lunar nodes, their role in synastry, and their importance in the process of the evolving soul. Her familiarity with the Vedic system and its mythology brings a unique perspective to her interpretation of the nodes. 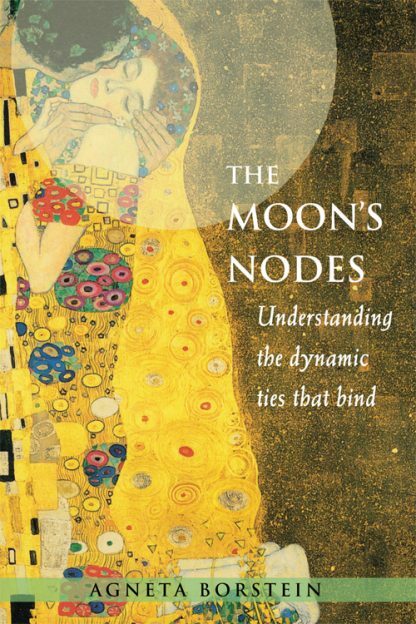 Borstein presents the fundamental facts about the Moon's Nodes and includes discussion of the True and Mean Nodes, the nodal cycle in transit, natal signs and houses of the nodes and their meaning, especially in how to move from the wounded soul, represented by the South Node, to higher consciousness, represented by the North Node. This is a revisid and expanded edition of The Moon's Nodes. A Churning Process of the Soul expands on the nodes in synastry and their roles in our relationships. She presents the Hindu myths related to the nodes with an emphasis on the goddesses as consorts to the male deities and how their stories connect to the Lunar nodes. In her synastry study of Angelina Jolie, our modern day goddess and her consort Brad Pitt, she interprets the ties that knot them together. Agneta Borstein is a professional astrologer with an international clientele. An active teacher, lecturer and writer with over 30 years experience, she has appeared on TV and radio, and has been interviewed by numerous publications. She has spoken at several astrology organizations throughout the U.S. Agneta is also trained in Soul Retrieval. Born in Sweden where she obtained her advanced degrees, she now maintains a private practice in Connecticut. She is a past president of the Astrological Society of Connecticut and an ongoing member of the National Council for Geocosmic Research (NCGR). To learn more visit www.CrescentiaPublications.com.